High-quality cotton Tanks -- rich durable silk screen front and back. Our popular Crown logo in special Yandall Yellow colorway. The Crown Logo was Chris Yandall's favorite and this run was made as a tribute to him. Black tank-style tee with yellow logo print. Crown logo is screened front and center with a back graphic "Ride With The Kings" screened on upper center shirt back. Available in standard adult sizes M-XXL -- please specify size when ordering. Also available in tank style tees and various hat styles too. 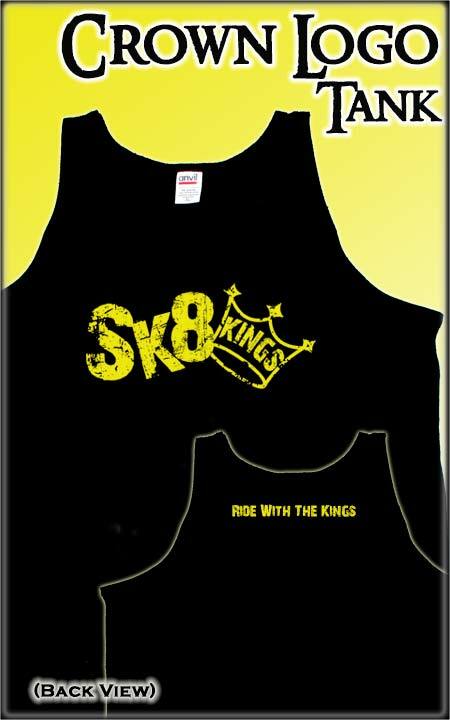 Sport your SK8KINGS colors!